My father had a few shirts he wore all the time. I remember one in particular. It was black, and showed some form of wooden gate in the graphic on the front. It was the kind of gate you might see entering the driveway of horse breeders, only it was rustic, built out of rough-hewn logs, and said the name of a national park across the top. He always wore it under his collared shirts and in the summer would unbutton them, and leaning back in the sun on one of our weekend trips to Dorina Lake in Oregon, the shirt would be there, its yellow gate emblazoned on a black field. This shirt, as with the others, was worn until the collar frayed and split, the sleeves began coming apart, and the shoulders turned threadbare and grew holes. My mother always tried to get him to throw his shirts away but he never did. He wore all of the new shirts she bought him once and then the old ones would be back, their holes getting bigger and their fabric thinner. My father kept the things he liked, the things he felt good in, the things he felt connected to. My mother, on the other hand, loved throwing things out. She loved clearing brush, weeding, taking things to the dump. At our house in Upstate New York she would always make brush fires and then carry anything she could burn out from the basement, any boxes or old furniture, anything that was taking up unnecessary space. My father was the opposite. Even though he had always been a nomad, he hated throwing anything out. His study was filled with little business cards from cafés and music stores, ticket stubs from concerts, every kind of imaginable instrument and rows and rows of books, many of them lugged across continents. It was common for my mother to come into his study and point to a dodgy old object found in the basement asking to throw it out and he’d rush to take it quickly from her hands and find a special place for it on his shelf. Sometimes my mother would get incredibly inspired. She’d come in from clearing brush and throw her gloves on the counter. She’d say, “I feel so good today, everything is going so well, it just feels so good to clean!” Then she’d take a big drink of water and go back outside to throw more things on the fire, to sweep away the old. “You have to make space for new things to grow,” she’d say, her cheeks flushed with excitement. When my mother got like this my father would disappear into his study and bend his face down over his keyboard or stacks of corrections. He’d run his fingers through his hair until it formed a long horn hanging down over his forehead, and like an old skinny elephant he’d sit in the middle of all his treasures, surrounded by memories, stubborn to the dust being kicked up around him. My mother knew my father well, she knew how he thought, what he cared about. 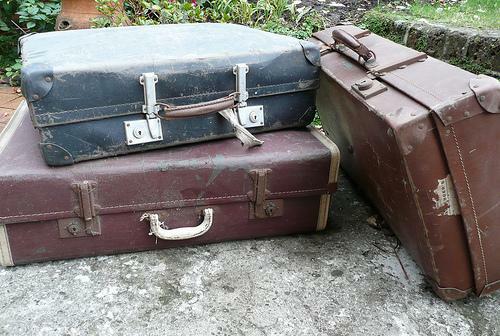 But even for her it was difficult to understand why anyone would want to keep the two black moldy suitcases that had lived in our basement now for the past eleven years. Maybe she figured it wasn’t that important that they had lived in an old closet in Oregon for nine years before that. Maybe she even thought it was disgusting that they had survived long enough to live in a closet in the apartment in Germany where I spent my first few years, or the apartment in England where they had first met, or how they were the suitcases that had accompanied him from there to Switzerland where he had worked in a chocolate factory, and from the factory to his years in the band in Schwenningen, Germany, and from there back to Switzerland, and then back to Johannesburg where they had fled the draft with him after he had finished university; back to Stuttgart, Germany where he went to high school for a year; back to Empangeni, South Africa, to Cape Town; and finally back to Davos, Switzerland where his father had saddled him with the responsibility, at age seven, to go buy suitcases for himself, because they might be traveling quite a bit in the years to come. But my mother must have only seen the battered outsides, the infestation of mold, the old brass buckles, as she, full of delight, threw them into the fire. She probably didn’t count on him coming outside just then, coffee cup in hand, only to see his two suitcases going up in flame, their flimsy ribcages pointed up to the sun, his twin companions cremated, gone forever, their memories sucked into the deep red and orange of the flames, a part of him lost. She knew what she had done, though, when he even rushed a few steps forward, tried to save them from the fire. All of her inspiration fell away when she saw the devastation spread across his face, all of the trains and mountains he had seen, the villages, the people, all somehow betrayed by this act, like their memory was no longer worth saving. A silence built between them for the next week as she watched him sifting through the coals after the fire had gone out, pulling the brass buckles from the feathery ashes and rubbing them gently off like sacred stones. She watched as he sat them on a shelf in his study, part memory, and part reminder of its importance. This entry was posted in Issue 13:1 and tagged Creative Nonfiction, Matthew Zanoni Müller by TC Editors. Bookmark the permalink.